Zac was born on rememberance day 1996. Gayle (Merriwa) had used Rommel at stud. I did not have any plans to add another to the family, but during my frequent visits to see the puppies, I fell in love with one - my Zaci boy. So at 8 weeks old Zac came home with me. 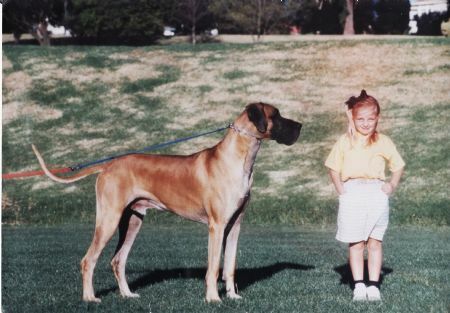 Like many of my Danes before I did not show him until he was in Puppy class. After a couple of open shows, he was ready for the Royal Melbourne Show 1997, and he did it in style winning Puppy of the Day and one of the 4 finalists for Puppy in Group. I didn't show Zac all that much as showing was not top of my priorities at that stage in my life, he like the others before him titled quickly and with many Group and In Show awards. I brought Zac out rarely after he was 2 years old, mainly at specialties, were he did rather well taking Res CC twice and numberous Best Head and Best Movement awards. It was 2004 and the GDCV Specialty was looming. I looked at Zac and even though he was 8 years old I thought he still looked in super condition. So with his full grey face I showed him under Italian judge: Mr Salvo Tripoli, when he asked me his age he commented what excellent condition my dog was in. With that he awarded him 1st in Open Dog, he went on to give him the CC and Best In Specialty Show. It was only the next year that cancer took my baby. Gone so suddenly, but never, ever forgotten.